Who is the competition open for? 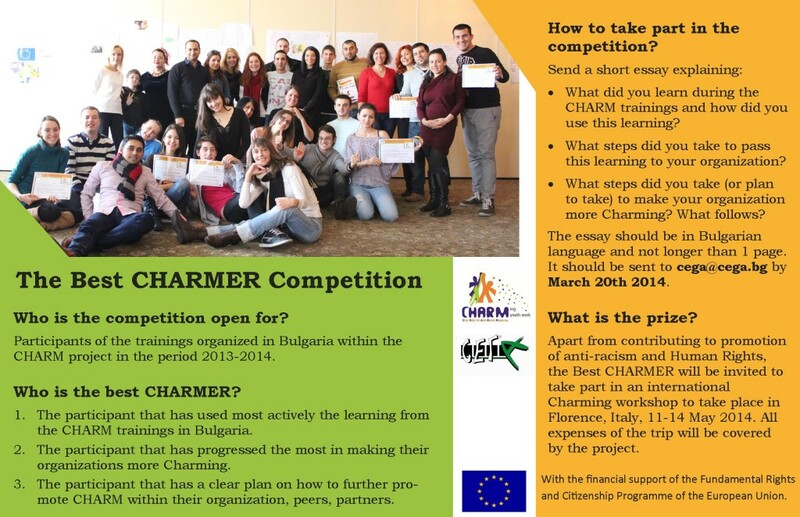 Participants of the trainings organized in Bulgaria within the CHARM project in the period 2013-2014.
Who is the best CHARMER? 1. The participant that has used most actively the learning from the CHARM trainings in Bulgaria. 2. The participant that has progressed the most in making their organizations more Charming. 3. The participant that has a clear plan on how to further promote CHARM within their organization, peers, partners. What did you learn during the CHARM trainings and how did you use this learning? What steps did you take to pass this learning to your organization? What steps did you take (or plan to take) to make your organization more Charming? What follows? The essay should be in Bulgarian language and not longer than 1 page. It should be sent to cega@cega.bg by March 20th 2014. Apart from contributing to promotion of anti-racism and Human Rights, the Best CHARMER will be invited to take part in an international Charming workshop to take place in Florence, Italy, 11-14 May 2014. All expenses of the trip will be covered by the project.